Choo-Choo CloningTM Kits are highly efficient directional PCR cloning kits for rapid, ligase and restriction enzyme-independent PCR cloning. Choo-Choo CloningTM Kits are highly efficient directional PCR cloning kits for rapid, ligase and restriction enzyme-independent cloning of PCR products. They allow to clone any PCR fragment into any linearized vector at any location. By simply incubating on ice, the ends of a PCR-generated DNA fragment can be precisely fused into a DNA vector with 6 bp (or more) overlapping homologous sequence. The system is very robust. Up to 8 PCR-generated DNA fragments can be assembled and cloned into one piece (up to 10 kb in one step). The system is highly efficient, with 98-100% positive colonies. 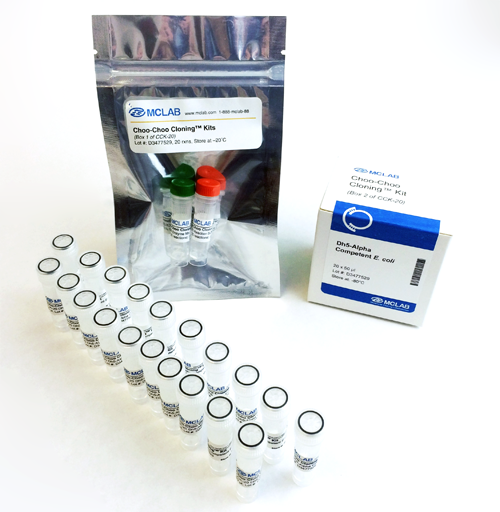 The function of Choo-Choo CloningTM Kits depend on MCLAB's proprietary enzyme systems. There is no need for restriction enzyme digestion, ligation, or blunt-end polishing. Any extra unwanted bases can be eliminated in the final construct. The linearized vector can be generated by PCR or restriction enzyme digestion. The PCR fragments can be generated by Taq DNA polymerase or other high fidelity DNA polymerases. 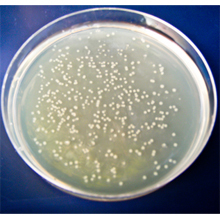 The addition of a A by Taq DNA polymerase is not required and has no effect on cloning efficiency. 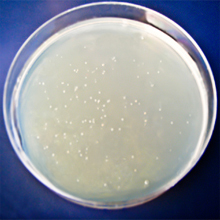 If the PCR product is amplified from a plasmid template, then it needs to be gel-purified to reduce background. In addition to PCR cloning, Choo-Choo CloningTM Kits also have the following aplications: adaptor, linker and tag addition before and after the inserts, and gene synthesis. Store Box 1 at -20°C. Store Box 2 at -80°C. The Choo-Choo CloningTM Kits are available in 10-, 20-, 100-, and 96-reaction sizes.